Although a direct comparison can’t be made due to variations in geology and parking requirements, a conservative estimate, confirmed by experts in the field, indicates that development in Paceville will generate around two million cubic metres of construction waste. A report by the Environment Resources Authority described the amount of construction waste from the Sliema Townsquare project as a major impact, because the 109,215 cubic metres of construction waste from this project amounts to 7.7% of the annual amount of construction waste dumped in Malta. With more high-rise developments - all of which require excavations for underground parkings - expected at Mriehel, Tigne, Qawra and Gzira the situation could reach unsustainable proportions. The situation would worsen further if a tunnel is developed connecting Malta to Gozo. Sources in both the Planning Authority confirmed that the vast quantities of construction waste generated by these mega projects will increase political pressures for land reclamation projects like the ones being proposed in Portomaso in St Julian’s and Jerma in Marsascala. Land reclamation using construction and demolition waste was already proposed as a solution in 2006 by the previous administration during a similar construction boom but a study conducted by British consultancy Scott Wilson concluded that this was not economically feasible due to large financial cost involved. According to the report these costs can only be redeemed through large-scale real estate development in ecologically sensitive areas. 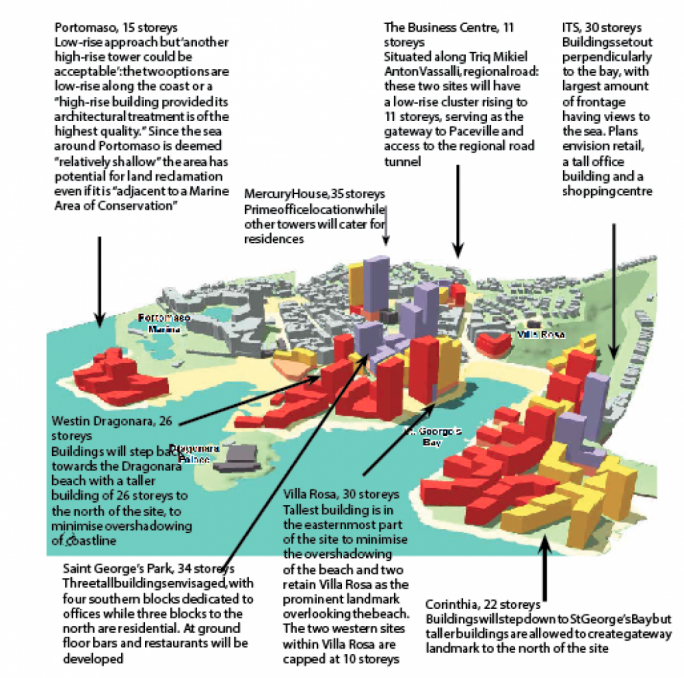 In this way land reclamation would fuel even more construction activity. Surprisingly this resource problem is completely overlooked in the master plan for Paceville which proposes nine sites for high rise developments in Paceville and a land reclamation project over 38,700 square metres of reclaimed land which will include buildings rising up to 15 floors. The master plan simply states that excavation, construction and demolition wastes are disposed at 16 permitted spent quarries. But a study commissioned by the Planning Authority in 2007 concluded that no space would be left for construction waste to be dumped in Malta’s disused quarries by 2020. Malta could have gained some more years because of a drastic decline in the amount of construction waste, from 1.3 million tons in 2008 to just 300,000 tonnes in 2009, may have given Malta more time. But with construction activity booming again space in disused quarries may run out sooner. Another option is to dump construction waste in the sea in a spoil ground located northeast of Valletta. A staggering 2.3 million cubic metres of construction waste was dumped in an offshore “spoil ground” located northeast of Valletta harbour between 2003 and 2010. The environmental impacts of this operation are still being assessed. But Malta’s waste management plan regards dumping-at-sea as a temporary solution to the problems associated with the disposal of large amounts of inert waste in Malta and recognized that this activity has to be phased out due to Malta’s international obligations. Land reclamation itself - which is being proposed at Portomaso, could be in breach of EU environmental legislation protecting Posidonia meadows, a protected marine habitat. Already in the 1990s the PA had fined Portomaso’s developers Lm50,000 (€120,000) for destroying Posidonia meadows following excavations for their yacht marina. Divers in the area who have spoken to this newspaper confirmed that the ecology of the area is still recovering from the degradation suffered in the 1990s when Portomaso was developed. Follow Original Article Link - MaltaToday, James Debono, 6th October 2016.